Wanderlove was actually difficult for me to rate. While there were aspects that I absolutely loved, there were others that fell flat for me, and others that flat out didn’t work. I attempted to read this book numerous times before I actually managed to push myself into it. I would make it to the 15% mark, put it down, uninterested. 20%, put it down, uninterested. The beginning simply did not catch my attention, and for this reason, I’m actually tempted to give it a lower rating. However, on my third or fourth attempt I found myself unable to put it down. I loved the characters and the settings. Hubbard does a fantastic job with making these characters feel authentic, and likeable. Rowan had a little bit of swoon factor, and Bria was an artist, which I am a sucker for. I loved their growth throughout the story. The drawings throughout the story added an extra layer that sets this book apart from most contemporary novels that I have read, and it made it that much more enjoyable. The settings are vivid and left me feeling like America was inadequate, and suddenly I was aching to travel. To see something beyond these borders. The romance was fun for me, though I didn’t see the tension that a lot of people have raved about. I thought a lot of the build-up in regards to Rowan and Bria’s secrets were pointless, as the “reveals” were pretty anti-climatic. Maybe I’m just not easily shocked, or maybe I should just chalk this up as another thing that makes the story realistic. But I thought they would be more intense, and there are things Rowan and Bria never end up sharing with each other. With Bria, this was tolerable because at least we knew, but we didn’t see many of Rowan’s secrets. One of them was key to the story and to Rowan’s attitude, but we never find out the story behind it. This is probably my only *real* let down with Wanderlove. 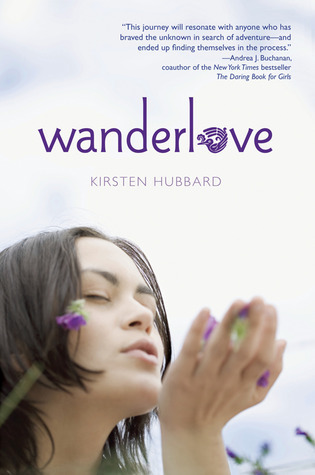 Overall, Wanderlove is an engrossing read that will leave you aching to see the world. I would recommend it. I've been really interested in this book since I first heard about it, as I traveled a lot until last year. I'm kinda glad to find out that the romance isn't the biggest part of the plot. Great review! I'll be sure to pick it up soon. I thought the travel aspect was handled great but I've never traveled, so I'll be interested in seeing what you think since you have! I absolutely loved this book. I totally agree that it makes you want to travel the world. I also agree that the buildup to the "secrets" were a little too much. Great review! Thanks for being honest about your difficulties getting started. Now I know that I totally shouldn't give up if I'm bored at first, because it will be worth it in the end. Always a good thing to know! I mean, even with that, four stars! I am glad to know that I am not the only one who will keep going back and forth on a book before really falling into it. I am always glad when I do because I am pleasantly suprised how much I liked it. Thanks for that! I agree! Divergent, The Host, are a couple examples of books I wouldn't have been able to fall in love with if I hadn't made myself push forward a bit. I have looked at this one a couple of times and have ended up going with a different book. I usually like these travelogue type stories. It does sound good and I appreciate your cautionary points. I absolutely loved this book. I really adore Kirsten's writing style. She just touches me everytime! Glad you enjoyed it.